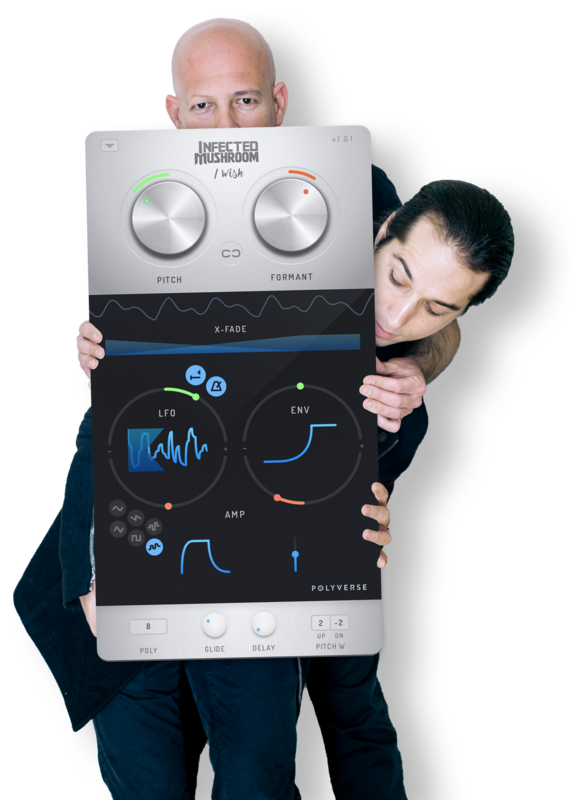 Award-winning and critically acclaimed electronic duo Infected Mushroom have released I Wish, their first effects plug-in, through developer Polyverse Music. Fans of Infected Mushroom will remember the innovative sounds from their classic track “I Wish” from their smash album Converting Vegetarians. Always pushing the limits of electronic experimentation, Infected Mushroom produced the robotic vocal melody from the song after days of editing and rearranging small loops of audio. Realizing the potential for this technique, Infected sought out developer Polyverse Music to create a plug-in that could simplify the process. The result is I Wish, which features an innovative processing technique dubbed “pitch freezing. Infected Mushroom has used I Wish on many of their newest tracks, including a large portion of their latest album, Converting Vegetarians 2. Pitch freezing enables unique sound manipulations, including imposing pitch on any audio clip, dramatic vocal mutations, and distinct glitch effects. At 100% wet signal, I Wish can even be used as a real-time wavetable synthesizer. Automation of parameters increases the vibrant results. All controls are intuitive and precise, whether managed with a MIDI controller or with a mouse and keyboard. The plug-in is available in VST, AU, and AAX formats, making it compatible with a variety of host applications, including Ableton Live, Logic, Pro Tools, Cubase, and Studio One. It can be used in 32- or 64-bit instances with Windows XP and later and with Mac OS X 10.6 and later. About Infected Mushroom – Known as pioneers of Psy-Trance, Infected Mushroom have been revolutionizing electronic music since their first official release, The Gathering, in 1999. Their highly unique and sought-after sound has twice landed them in DJ Magazine’s 10 Best DJ’s and has earned them a devoted fanbase. Their pursuit of the unknown can be heard throughout all their albums. Infected Mushroom continues to expand their musical prowess, experimenting with new techniques that inspire and impact the electronic music world. About Polyverse Music – Polyverse Music is a company dedicated to collaborations with the most innovative musicians of our age to create musical instruments and tools for fellow musicians.